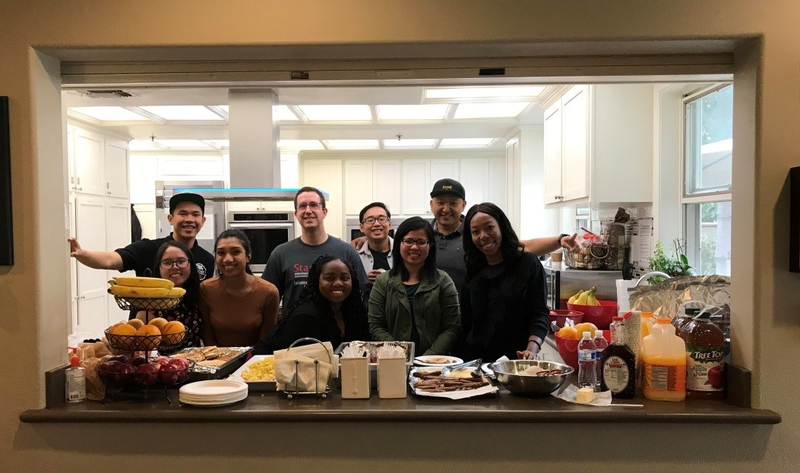 Members from ASCE OC Branch and YMF hosted a breakfast meal service on June 16th at the Ronald McDonald House located in the City of Orange. Ronald McDonald House is a nonprofit organization founded in 1974 in Philadelphia, Pennsylvania. The organization has about 364 houses worldwide. The main purpose of these houses is to give families with children who have serious illnesses or injuries a place they can call home while undergoing treatments at nearby hospitals. Each house provides families with home-cooked meals, bedrooms, and playrooms at little to no cost. The breakfast meal service began at 7:00 AM and ended at 11:00 AM. We were divided into groups to help with the cooking. One group was primarily responsible for making buttermilk pancakes and banana pancakes. Another group was in charge of cooking bacon, sausages, and scrambled eggs. We provided turkey bacon, two different kinds of sausages, and two different kinds of scrambled eggs to give families different alternatives. Fruits such as banana, oranges, and apples are served along with juices. Everyone also cleaned and washed the dishes after. During the meal service, we get to eat together with families that were staying there to learn more about their stories. They were very nice and appreciative of what we had done. Knowing that we are making a difference in our community makes us very happy. We had an amazing time cooking and serving. Please join us at our next volunteering event!